During my first cancer treatment I was scared and in pain. I wanted hope and an escape, reassurance and strength. It came in the mail. I received a hand written letter full of empathy and understanding from a guy named Brian. He had suffered from Crohn’s disease and knew what it was like to feel young and beaten down. He told me to remember often the time in my life when I felt the most proud of myself, to remember the details of that moment and how it made me feel. It would get me through the worst of times, he said. And he was right. I remembered a dance performance I created two years before my diagnosis. I worked so hard and fiercely designing the movement, costumes, the sound score, and an intricate backdrop. I worked with an opera singer, live musicians, and dancers. I wove together their stories with historical documents. At the end of each performance the audience and performers were teary eyed. It made people think and open up. It was the shining moment of my lifetime. When I was my lowest during treatment, I took Brian’s suggestion and showered myself in the memories of this hard work and sense of accomplishment. It stirred in me the feeling that I could do anything. In moments when I wanted to die, these memories reminded me about the best parts of living, and that I wanted to make more work that would deeply affect people. Here was the clincher though: I didn’t know Brian. We went to the same college. He heard about my cancer through the grapevine and went out of his way to obtain my address and send me that letter. Someone who I don’t even know played one of the biggest roles in getting me through the emotional treachery of my treatment. Years later, I’m now trying to find him. I’d like to say ‘thank you’. Have you ever received wisdom, advice, gifts, cheering on or help from strangers? Have you ever given it to a stranger in need? Do you have a “most proud moment”? 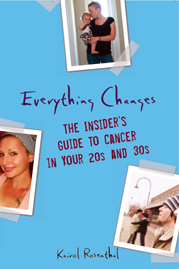 Read Everything Changes: The Insider’s Guide to Cancer in Your 20s and 30s to learn more about the stranger who sat with MaryAnn and got her through her hardest day of treatment. Someone I technically went to school with (a year behind me), who I’d never met, found my blog while googling his diagnosis–which was the exact same as mine, about nine months later than mine. We emailed and IM’d throughout his treatment and I sent him treatment-appropriate care packages prior to the major milestones (surgery, start of chemo, etc). After navigating my slice of cancer hell half-blind, I was glad to be able to be a guide for someone with whom I had a bit in common (ND alum, married parent of young toddler, etc). It’s one thing to be told by a doctor what surgery recovery and chemo side effects are going to be/feel like, it’s quite another to talk to someone who has actually been there. I really didn’t have the help from strangers thing. I was, however, amazed by how many friends came out of the woodwork to do things that my family wasn’t available to do. Some who were just acquaintances prior to diagnosis are now the best and closest friends I have. It’s really sometimes amazing what people do when they find out about my diagnosis, both for good and for bad. you know funny you mention this. I sent a writer an email and having never met me, she befriended me and has been a real pal, and has helped me through somehard times and does not even know. it…..
Jon, You are making me blush! Glad you bought my book and and am damn glad you sent me that first email. Here’s to many more. I can also relate so much to Frank when it comes to acquaintances helping out. I will write a blog post some day about my now friend Rachel, who showed up to my house on a first date (she dragged the guy along) so she could help me do my dishes. I hardly knew her at the time. We are now great friends. There are some people in NYC who I’d never met until I was about to check into MSKCC for operation #1, or until I had to travel there every month for treatments. Some of them shepherded my not-NYC-savvy family members through the city while I was in the hospital (thank you, Miracle House volunteers — Jose, hope you’re doing well!) One person has become a long-term friend – the woman from whom my younger brother has rented a room for the last four years. My youngest brother relocated from St. Louis to central NY after I was dx’d, and after my surgery he decided to move to NYC to be there when I came down each month for treatments. We went together to look at the room in a flat on the upper East side. When Cher (the apt. owner) found out that I was a cancer patient who’d be coming back for treatments, she suggested that I stay with them whenever I needed to come to the city. She didn’t know either of us, but her generosity in sharing her place far beyond one room and a bath really helped me financially and emotionally through the last four years of treatments and surgeries and recoveries. Thanks, Cher, for everything. And like Frank, I’ve been the grateful recipient of a lot of help from my co-workers and dog-training friends. I’ve been a buddy for the Colon Cancer Alliance since 2005…hoping that by giving back to others who are on the same road, I can pay forward at least some of the random kindness I’ve received. 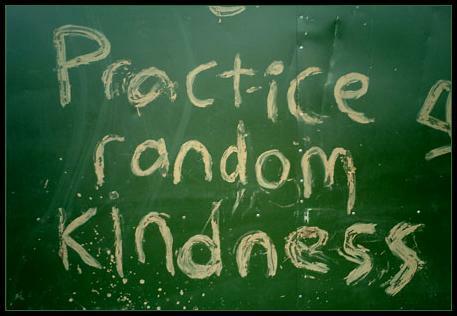 Just yesterday, in fact, I received an act of kindness. It was one of those overscheduled cancer patient days: PET Scan and 8:45 a.m. and chemo at 11:00 a.m. There’s a reason it was overscheduled but it’s irrelevant to the random act. So there I was at chemo, in a solo room, when women from a local hospital dropped off hand-knitted throws. Now, I don’t “need” another throw…but I accepted one anyway. Sitting there marinating, it was so warm and cozy. Felt like a hug from everyone who loves me.